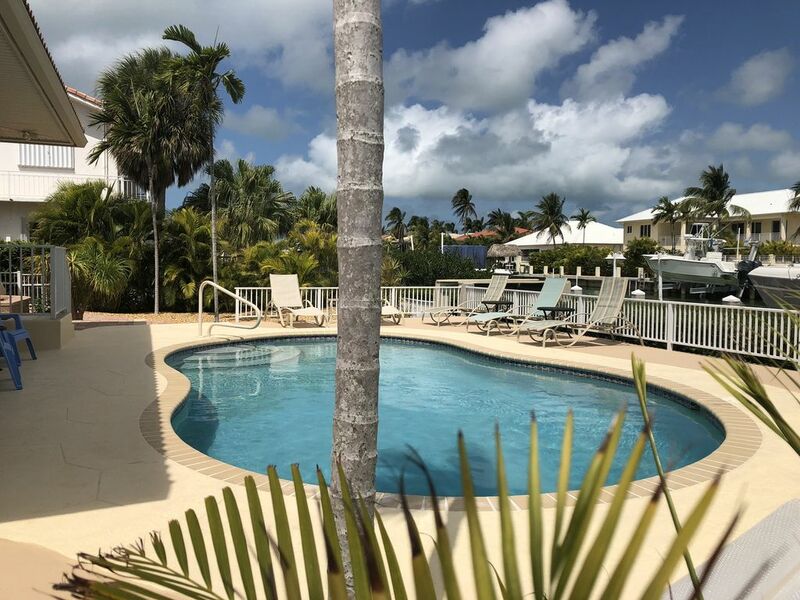 This is a spacious, beautiful pool home on a wide clear canal in Key Colony Beach, Florida. The home is well furnished in a tropical style and has room for couples or families. There are 3 bedrooms, all with king beds. There is a queen sleeper in the Florida Room. The master has a private bath with dual sinks and a shower. The guest bath has a tub/shower combination. All bedrooms have ceiling fans and TV's. All of your bed linens, bath towels and kitchen necessities are provided. Just pack your clothes and buy some groceries and you are all set! Or, skip the groceries, there are wonderful restaurants in Key Colony Beach as well as Marathon. Outside there is a relaxing pool. We have done a lot of work in the pool and yard area since we purchased in 2010, and there's plenty of room for the family and friends. There's a gas grill. The dock will accommodate up to a 30' boat and there is a fish table, water and electricity at the dock also. Enjoy access to the Inch Beach on the ocean. It's an easy walk from the house. Inch Beach is owned by local property owners. It is gated and available to owners and their guests to enjoy the sandy beach and the beautiful waters. On half of the 2 car garage is available for your vehicle, your fishing gear, bikes, etc. can be stored in it, The driveway is large and there is lots of room in the yard for parking of a car or trailer as well. We love our new home and think you will too! Call (419-236-0599) or inquire online today! We are a couple from Ohio and this is now our winter retirement home. We owned 2 different houses on 10th Street since March 2001 and always had the dream of owning a single family home. That dream came true in May 2010, when we purchased this beautiful home. We have been busy updating, decorating and just having fun. We love having family and friends down to Key Colony Beach...and they love visiting! Being from Ohio, we enjoy all of the outdoor restaurants. There are many restaurants in the Key Colony Beach/Marathon area and it's our goal to try them all. We purchased in Key Colony Beach after vacationing in Marathon for 3 winters in a row. We discovered Key Colony Beach and knew It was the place for us. From this home we walk to Sunset Park, Inch Beach and can walk to 3 restaurants. We enjoy walking the whole island, always feeling safe. This single family home property is spacious and you get a feeling of privacy, on a quiet street, while at the same time enjoying the tropical views. There are relaxing options poolside - chairs, loungers, 2 dining tables. This is a great home to enjoy outside whether you prefer sun or shade. Our pool does not take up all of the yard so there is open area. Street side there is a large yard to park your boat trailer. We are just a street off of the open water. Sit on the sofa in the living room and you can see the ocean. Open ocean views from great room and kitchen. We are on a wide canal with dockage for up to a 32’ boat. DECEMBER-JANUARY - room to store your fishing gear, bikes, etc. MAY-OCTOBER - one half of 2 car garage open for renters' use. The living room is open to the dining and kitchen area. Very open floorplan. Kitchen equipped with everything you would need - except the food. We have 2 dining areas side-by-side which seats 8-10. We also have the breakfast bar with 4 stools. Boats available at many places in many spots in Marathon. Pool deck with chaise loungers in the sun and chairs in the shade. Two outside dining tables. Pick your spot! We have morning and afternoon sun on the pool. Late afternoon, there is shade which is great on those hot summer days. Pool heat available for $100/week. KCB even has a pickle ball courts! Also the Inch Beach is available to renters at no charge. Marathon. Go to the 7-Mile Bridge and walk it! Pet Policy - Maximum of two SMALL DOGS (30 lbs or under). Only dogs may be allowed with prior approval. ** There may be an extra cleaning charge if home is left excessively dirty. ** Pool heat, if needed, is available at $100/wk.